Last week, tenants and housing activists all across the country staged protests and lobbying sessions as part of the Renters Rising for Rent Control Day of Action to demand immediate relief from the housing crisis. In New York, California, Illinois, and other states across the country, activists are rallying around rent control, a policy that, in broad terms, limits rent increases and guarantees a tenant’s right to a lease renewal. Rent control was once widely available, highly effective, and broadly popular with the American people, but fell out of favor over generations of suburban sprawl and neoliberalism. It’s making a comeback. The rent control movement, which is growing rapidly among activists, academics, and public policy makers, is a testament not only to the gravity of the housing crisis facing low and middle income renters in all types of living arrangements, but also to the disgust that they share with a political and market system that so far has utterly failed to address it. The growing political alignment around renters’ rights unites downwardly mobile millennials -- whose student debt has depressed their ability to buy homes -- and long time renters, many of whom people of color who have been purposefully excluded from homeownership for generations. It is an increasingly potent electoral force. The Democratic Party has been criminally slow to respond to the housing crisis -- despite it’s scale and urgency. For years, the party’s response has been to lavish ever increasing subsidies on private developers in return for a comically small amount of housing units. This has stripped “affordable” of any real meaning. This method has failed to build an adequate amount of housing in general, let alone deeply, permanently affordable housing - while it has succeeded in transferring billions of public dollars to private developers and investors. “For years, [local politicians] gave these developers all kinds of tax abatements to build supposedly affordable housing. Then after 25 years they go back to market rate and make it easy to push out people harder and faster. All this money we’ve given them and then you’re gonna let them privatize it and sell it? It’s crazy,” says Nathylin Flowers Adesegun of VOCAL-NY, a grassroots HIV/AIDS membership organization that is part of the coalition fighting for expanding rent control in New York. Adesegun, who after 34 years in her rent stabilized apartment was forced out and has spent the last three years in a women’s homeless shelter, made headlines last October when she confronted Mayor de Blasio outside of his gym in Park Slope over the city and state’s failure to provide more housing for the homeless. She’s been an outspoken advocate for strengthening rent control laws to fight homelessness and displacement before it starts. It’s been obvious to most voters, even the Federal Reserve, that we can’t lower rents or prevent displacement by building more housing alone. The pernicious legacy of exclusionary zoning continues to prevent housing construction where it is needed or warranted in cities and wealthy communities abutting them. Even if exclusionary zoning ended everywhere tomorrow (and it should), we would not be able to build fast enough to help vulnerable renters and communities right now. Furthermore, the globalized economy is packing a one-two punch on the American home by making it harder for families to buy or rent, while making it easier for investors to speculate on both. Private equity firms, foreign investors, and other Wall Street backed interests are increasingly viewing American apartment buildings, single-family homes, and even mobile home parks as a lucrative asset class, which is raising rents and causing displacement even outside of coastal cities. Today, the rent control movement is demanding that the Democratic Party think bigger and faster about protecting renters. They are doing so through unprecedented coalition building efforts of all types of renters, homelessness victims, and even small landlords in urban and rural settings. Encouragingly, there are signs that their efforts are moving the party and the policy discussion towards rent control. This puts pressure squarely on a handful of Democratic governors and Democratic-controlled state legislatures to step up first. The movement has flexed its muscle the most in New York, where the Housing Justice for All campaign has painstakingly built a statewide renters coalition focused on passing a platform of renters’ rights bills called Universal Rent Control. In addition to strengthening current rent regulations (the majority of which are concentrated in and around New York City), URC expands powerful protections to all tenants across the state and fully funds homelessness prevention and supportive housing services. The coalition is already changing New York politics by showing Democrats both the cost of ignoring renters and the opportunity in supporting rent control. In the fall midterm election, HJ4A played a critical role in delivering the largest Democratic majority the state has seen in a century. It didn’t just flip seats from Republicans. It ran progressive pro-tenant candidates against incumbent pro-real estate Democrats and won big. Members of HJ4A include NYC-DSA and New York Communities for Change -- two groups that refused to endorse any candidate that accepts real estate money in a state that is run by it. The trend to reject real estate money is already spreading to other Democrats. Most importantly, the campaign has opened a real path for passing Universal Rent Control in Albany. Even Governor Cuomo, a true friend of real estate, is acknowledging this new reality and is on the record supporting URC. HJ4A isn’t taking anything for granted and delivered a 3,000 signature URC petition to the Governor on Wednesday in addition to lobbying legislators with the latest polls on rent control. “People have gotten the will to say ‘this has got to stop’. We defeated the IDC and got a lot of new senators elected. The old ones are gone. The new ones can’t be bought. This makes me really hopeful,” says Adesegun. In California, activists across the state organized by the Housing NOW! coalition continue to fight for expanding rent control despite the defeat of Prop 10 last fall. The ballot initiative was designed to expand rent control protections state-wide, but the real estate lobby spent millions of dollars to confuse voters. It also suffered from poor wording designed by a state agency that never even mentioned rent control. Source: USC Dornsife/L.A. Times poll. Percentages do not add up to 100% due to multiple responses. Margin of error for eligible voters is plus or minus 3 percentage points. Successful rent control campaigns in Los Angeles, Richmond, Oakland, and even a near miss in San Diego back up Svanoe’s assertion. 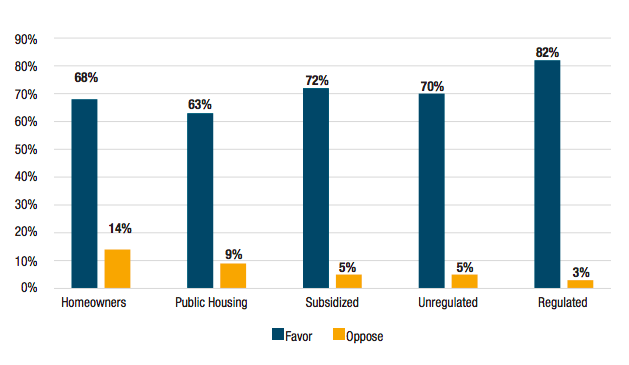 In addition to building on these local battles, the movement is also focusing on Governor Newsom, who has yet to embrace rent control, despite an ambitious housing plan (that Data for Progress covered here). Last week, the coalition delivered a demand that the Governor support rent control and staged events around the capitol to make the movement’s power and resiliency known. In Illinois, activists are running into the same opportunities and challenges. One of them is overcoming a pre-emptive law against rent control passed in 1997 with the help of the infamous right-wing lobbying group, the American Legislative Exchange Council. Lift the Ban has been organizing tenants, community groups, and labor unions in Chicago to repeal the ban and introduce rent control as a solution to the displacement crisis. “This has to be the easiest education campaign I’ve been involved in. When I show up, people look out the window skeptically. When I say I’m here to talk about rent control, they literally find their way to the door. This is something the broader public loves and wants. We've had multiple referendums in Chicago, the lowest support we’ve received is 65%” says Jawanza Malone, Executive Director of the Kenwood-Oakland Community Organization and member of the Lift the Ban coalition. The problem, Jawanza points out, is legislators. As is the case in most state governments, little distinguishes Democrats from Republicans and both parties are beholden to real estate money. But the biggest problem is that most legislators are simply unaware of what rent control is and how it can solve the crisis. However, the coalition has a potentially powerful new weapon - recently elected Governor Pritzker, who ran on supporting Lift the Ban. The coalition spent last week’s press conference in Chicago reminding the governor of his pledge, educating legislators on rent control, and warning both that voters want action now. "There is a movement of renters demanding public policy that responds to the housing affordability crisis. Across the country, in cities and suburbs alike, people are forced to pay more than they are able to in rent, causing them to make impossible decisions about whether to pay rent, bills, or groceries. Now is an important opportunity for elected officials to curb corporate landlords, enforce universal rent control, and stop rent hikes." Goldstein is especially excited about the growing support for rent control in economic circles. Many of the long held knocks against rent control are being challenged as more data emerges around the nature of the housing crisis. Abstract concerns about supply and demand are falling away when compared to the real-life crises of eviction and displacement. The Center for Popular Democracy is working with the Right to the City Alliance and PolicyLink on an upcoming report on rent control that organizes these arguments and puts rent control firmly on the map as the best solution for policy makers. “Rent control is the most immediate solution to address the crisis right now. And it’s a key solution that doesn’t require massive public subsidies to private developers. It shouldn't be that corporate landlords gouge renters to make themselves richer. Rent control is a way to allow renters to thrive, while curbing corporate power, “ Goldstein says. The fact that fighting for rent control is so challenging even in deep blue states like New York, California, and Illinois shows how far the Democratic Party has to evolve to truly address the housing crisis. It also shows how deeply entrenched the real estate industry is in Democratic politics. These activists are using rent control to force the Democratic Party to make a choice between developer’s money and their voters’ wellbeing. If moral urgency isn’t enough, then political self-preservation should be. The Renters Rising for Rent Control Day of Action showed that there is a well organized movement of activists ready to embrace Democrats who step up and punish Democrats who don’t, whether at the local level or, perhaps, at the national level. Pete Harrison (@PeteHarrisonNYC) is a senior adviser to Data for Progress, focused on housing. He is a co-founder of homeBody.